The show closed with 25,150 people in attendance, a number comparable to the final Attendee total of 26,077 for the 2011 Convention, and to the final Attendee total of 24,206 for the 2010 event. The number of Exhibitors at the Orange County Convention Center was 1,073; booth spaces totaled 4,361, an increase over last year’s booth-space total. A total of 105 aircraft were shown on two separate static displays, and an additional four aircraft were shown inside the convention center. The show drew Attendees from all 50 U.S. states and 87 countries. Standing-room only general sessions that opened the show’s first two days, featuring celebrated legends in aviation, leaders in government, noteworthy figures in politics and media, and others. A full roster of education sessions held throughout the week, many of which focused on emerging trends, including the use of iPads in aircraft cockpits, and developments related to business aviation in Asia. A Convention-week Light Business Airplane Conference, with sessions specifically tailored to entrepreneurs and companies using light business airplanes, accompanied by a Single-Pilot Safety Standdown focused on business aviators. A Career Day featuring keynote speaker Barrington Irving – the youngest person and first African American pilot to fly solo around the world – who inspired young people to identify and pursue their dreams through aviation. A benefit event that raised $371,000 to support the Corporate Angel Network’s mission to provide transport for cancer patients to treatment centers aboard business aircraft. The industry’s enthusiastic response to six new advertisements featuring real-world accounts of people in the business aviation community to demonstrate its size, diversity and importance. 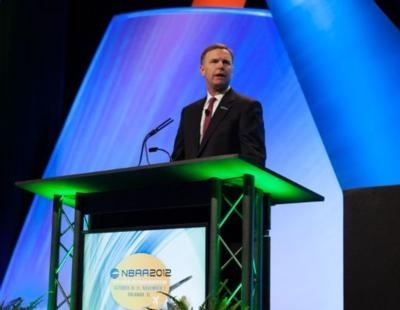 The ads were introduced at the Convention as part of the No Plane No Gain advocacy campaign, sponsored by NBAA and the General Aviation Manufacturers Association. A welcome new study, commissioned by NBAA, which concludes that more companies began using business aviation during the “Great Recession” than did so beforehand, and that companies using a business airplane were better inoculated from the recession’s impact than similar companies that did not use business aviation. The support shown by Convention participants for a continued advocacy focus, including an ongoing commitment to defeat proposals for implementing per-flight user fees for general aviation.